Hario, translated into the language of coffee, should mean happiness. 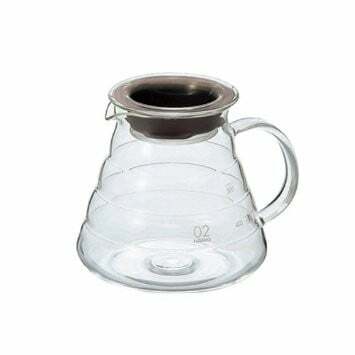 This little glass carafe can hold up to 600ml (20 ounces) and is made of heat-proof glass. The pieces alone are thoughtfully designed and when you combine them you get great coffee at home, for you and a friend! A 2012 Red Dot Design Product Design Award Winner! Multi-purpose - This cute little carafe can pour hot or cold drinks and even water houseplants. Fancy! - Put all the pieces together and your kitchen will look like a professional gourmet cafe counter. Glass/Silicone Lid - Nice for resting the dripper on when you are done or as a cap in the fridge for iced coffee. It is not a leak proof lid by any means. Konnichiwa! - There is very little information in English on the package. OK Over-fillers Anonymous: It is a 600 ml (20 ounces) capacity but we squeezed in up to 650 ml and still had room for the cap. Hand wash only with gentle soap and water. Microwavable.